Develop a closure strategy for LNAPL site and remediate petroleum impacts to groundwater and soil. 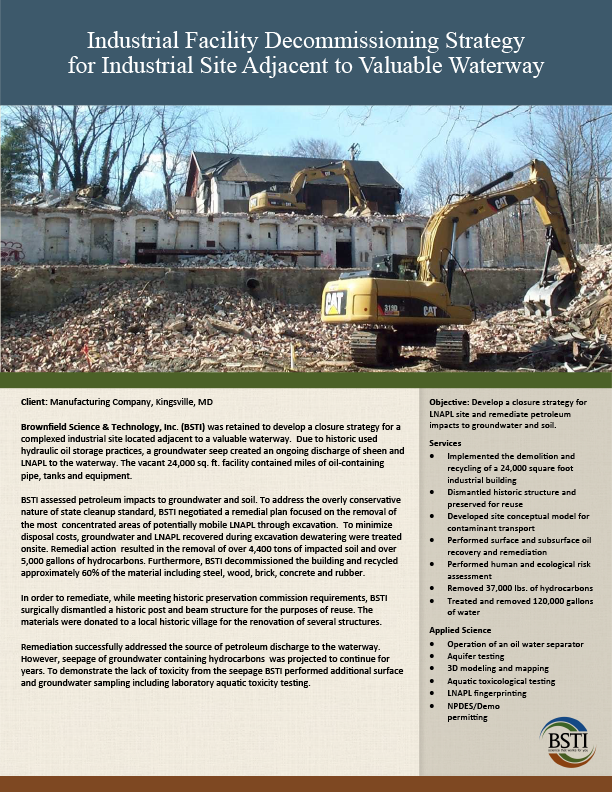 Brownfield Science & Technology, Inc. (BSTI) was retained to develop a closure strategy for a complexed industrial site located adjacent to a valuable waterway. Due to historic used hydraulic oil storage practices, a groundwater seep created an ongoing discharge of sheen and LNAPL to the waterway. The vacant 24,000 sq. ft. facility contained miles of oil-containing pipe, tanks and equipment. BSTI assessed petroleum impacts to groundwater and soil. To address the overly conservative nature of state cleanup standard, BSTI negotiated a remedial plan focused on the removal of the most concentrated areas of potentially mobile LNAPL through excavation. To minimize disposal costs, groundwater and LNAPL recovered during excavation dewatering were treated onsite. Remedial action resulted in the removal of over 4,400 tons of impacted soil and over 5,000 gallons of hydrocarbons. Furthermore, BSTI decommissioned the building and recycled approximately 60% of the material including steel, wood, brick, concrete and rubber. In order to remediate, while meeting historic preservation commission requirements, BSTI surgically dismantled a historic post and beam structure for the purposes of reuse. The materials were donated to a local historic village for the renovation of several structures. Remediation successfully addressed the source of petroleum discharge to the waterway. However, seepage of groundwater containing hydrocarbons was projected to continue for years. To demonstrate the lack of toxicity from the seepage BSTI performed additional surface and groundwater sampling including laboratory aquatic toxicity testing.